Soto Sponsors ‘Beers Before Gears’ to go Above and Beyond! 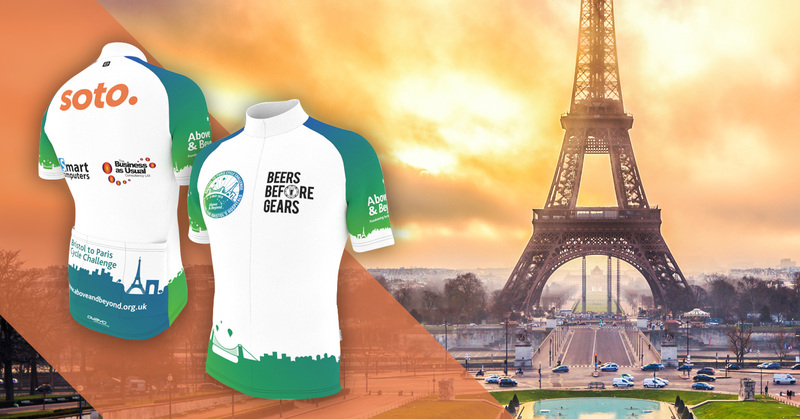 We’re very proud to be the main sponsors for the ‘Beers Before Gears’ team, which includes our very own Pete Marshall! Pete is taking on the challenge of riding a bicycle from Bristol to Paris, for local charity Above and Beyond; that’s 430km (267 miles to us non-continentals) in 4 days! Why, you might ask, would he do such a thing? Well, Above and Beyond are trying to raise £150,000 to buy a 3D ultrasound scanner to help operate on unborn children in Bristol, saving the lives of babies before they’re even born. Every year St Michael’s Hospital performs over 3,500 ultrasound scans on mums-to-be with complicated pregnancies. technology, leave babies at high risk of dying inside the womb. It’s such a great cause, and we wish the boys all the luck in the world on their quest! If you’d like to help them on their way, visit their Just Giving page and donate today!